Are you trying to tell me my research stinks? Skunks happen for a reason. I’m convinced of that now. In February, my family was left reeling from the noxious fumes of a skunk using the area under our deck as a late-night rendezvous location to get her groove on with the boy skunks in the region. We all hated that skunk more than anything, but I’ve developed a new appreciation for her since then. Why have I softened toward her, and how does this have anything to do with writing? She provided me with another thrilling adventure for my fatherhood blog (read it here). This alone did not make her visit worth it. It’s only in the last few days I truly appreciated her visit. I’m preparing a new novel, A Housefly in Autumn, for publication. It’s set in 19th century Europe. When you write a story about a different place and time, you research as much as you can, but some things are too obscure to discover. In these cases, you get things as nearly correct as possible and keep vague about details you can’t nail down. You avoid the impossible and keep to situations that, if not historically provable, are at least historically plausible. In doing this, you make assumptions. Sometimes, you don’t even realize you are making an assumption, and this assumption is the idea you fail to research. This is where the skunk comes in. In A Housefly in Autumn, there is a scene in which the protagonist mentions a skunk as if that would not be a surprising animal to see in a garden. At my house, it’s common. I wrote this scene years ago, and have edited it many times, without giving the skunk a second thought. On my fatherhood blog, I’ve mentioned skunks several times. People from other continents have commented, showing a perfect understanding of the hazards presented by the animal. This reinforced my assumption about the universality of skunks. Back in February, I found myself extensively researching skunks, trying to find the right solution to our infestation, and one image stuck in the back of my mind, waiting. A few days ago, I was scouring one of the last proofs of my novel. I came to the aforementioned scene for the thousandth time. On the thousandth time, the latent image from my skunk research rushed to the front of my mind. My jaw dropped. I hurried online to verify the image. It was a map of skunk habitat, and it was correct. Skunks are an American animal. Never would I have guessed there are no wild skunks in Europe. Pepe Le Pew is French, right? Maybe there are wild skunks in Europe by now, because those exotic animals from other continents rarely turn out the awesome pets promised, and they’ll probably survive in the woods behind the neighbor’s house. But in the 19th century, I doubt it. Needless to say, A Housefly in Autumn is now a skunk-free novel. Most readers may never have noticed, but I do hope to sell two or three copies in Europe. And who knows how many other naïve assumptions I’ve made? Just like every other part of a novel, the detail accuracy will never be perfect, but mine is now a little better, and I owe it to a real skunk. For my European, African, Asian, Australian, and Antarctican friends: this is what a skunk digging for insects on your lawn looks like. This is why editing is my least favorite part of writing, it’s so much easier to pretend everything is perfect. No skunks, who would guess? 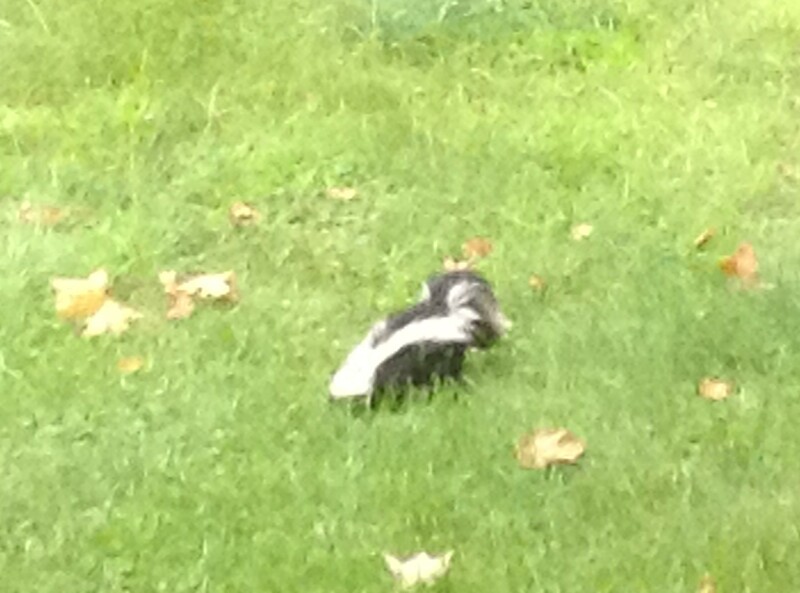 It’s good that I’m not European; I couldn’t live a full life without skunks in my yard. You’d have fewer blog topics, maybe a wild hedgehog would fill the gap. They are probably not stinky enough for my needs, but I guess I’d have to make do.